We are doing a little traveling this week. We are currently in Zion National Park and tomorrow head off to Bryce Canyon National Park. 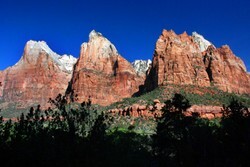 This photograph was shot in Zion National Park at a grouping of mountains called "The Patriarchs", after Abraham, Isaac and Jacob. These mountains are formed from Navajo sandstone and are incredibly majestic. Click the photograph for a larger view. As I mentioned in a previous post, my wife and I just completed the Series 100,200, and 300 class at Scottsdale Bible Church and have become members of the church. Having devoured that material and still ravenous for theological and doctrinal meat it appears that I have hit the mother load in that respect. Dr. Wayne Grudem is teaching Systematic Theology in a Sunday school class! Yabba-Dabba-Dooo! 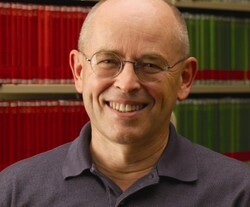 Dr. Grudem's biographical page, resume and papers/articles. He started his journey through his text book on Systematic Theology way back in September of 2005. I plan to catch up, but for the purposes of this blog I am going to start at the Doctrine of Election and Reprobation. This doctrine is the beginning of a 10 part series on Salvation. As I mentioned, he has already started this series but I will catch us up and then join his Sunday school class to join in the teaching and conversation in two weeks. This should prove to be a feast of theological meat! Phoenix, Arizona - My wife and I just returned from a very nice visit to the Phoenix Seminary. I had called South Smith (Sr. Development Officer) the other day to inquire about using some of Dr. Darryl DelHousaye's material on this blog. Dr. DelHousaye has a series CD's on Ecclesiastes that I would like to feature on this blog. As it turns out, I learned today, Darryl is in the final stages of releasing a book on the book of Ecclesiastes as well. Ecclesiastes is essentially the journal of King Solomon and the book promises to be a good read. I am looking forward to it. 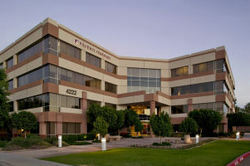 Phoenix Seminary is a young seminary but I was very impressed with the quality of the academians on board. Currently their faculty consists of Roger Ball, Fred W. Chay, Darryl L. DelHousaye, John C. DelHousaye, Wayne A. Grudem, Malcolm R. Hartnell, Justin M. Smith, Steven R. Tracey, Norman G. Wakefield and Paul D. Wegner. The Seminary currently has around 300 students and is really starting to see God's blessings in a growth spurt not only in student count but financially as well. We very much enjoyed our visit and feel incredibly blessed to have such gifted expositors of God's word in our back yard. In two weeks we are joining a Sunday school class where Dr. Wayne A. Grudem is teaching from his textbook Systematic Theology. Imagine going to your local church and having one of the world's top 5 theologians teaching you! How cool is THAT! In a few days the official beginning of the Christian classics blogger reading project starts. The homework assignment was to have read the forwards, by John MacArthur and Warren Weirsbe, and the introduction to the book by Arthur W. Pink. It is not too late to join us. Go grab a copy of the book and lets take this journey together. 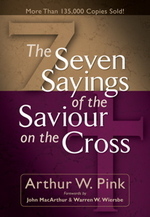 I am about to start a book study on "The Seven Sayings of the Saviour on the Cross" by Arthur W. Pink. Pink was an evangelist and bible scholar born in England in 1886. Pink came to America to study at the Moody Bible Institute and held pastoral positions in the United States, Australia, England and Scotland. He died in Scotland in 1952. I first heard about this book from Tim Challies who is hosting a "reading the classics" event with bloggers from all over the country and perhaps the world. At last count there were 59 different bloggers participating. "When I began my ministry over fifty years ago, like many other ministers of my generation, I found great help in the books of Arthur W. Pink. His reverence for God's Word, his desire to exalt Jesus Christ, and his emphasis on practical obedience all helped to keep me balanced in the study, in the pulpit, and in my personal life". 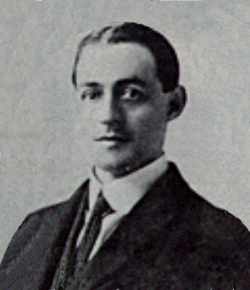 "Arthur Pink was a master of biblical exposition, carefully mining the biblical text for every once of true meaning, every nuance of doctrine, and every point of personal application he could discover. He always wrote with heartfelt conviction and persuasive insight. He was warm and positive yet bold and unequivocal". The event starts on April 24th. Why not pick up a copy of the book and join us. I suspect this will be a very insightful study on one of the great Christian classics. My wife and I just today completed the Series 100 - 300 classes at Scottsdale Bible Church and have become members of the church. For a lot of reasons, that I won't share here, I have never committed to a church before. But as I have shared, in previous posts, I am ready to begin a new journey in my life and I want that journey to be about the things in life that really matter. For me, those things are the things of Jesus Christ. Therefore, I am one committed and fired up dude about my new journey. Impatient...but fired up! One of the things that I have really come to appreciate about Scottsdale Bible Church is the expository preaching style. I have always been around topical style preaching and I am finding that I am being feed a full portion of meat with the expository style. Our first exposure to this style of preaching was with Darryl DelHousaye, (a student of John MacArther) who was the senior paster at Scottsdale Bible Church, but has left to put his full time efforts into the Phoenix Seminary as its president. We are now enjoying the expository preaching of Jamie Rasmussen, our new senior pastor. As I began to explore other expositors of the Gospel I came across John MacArthur, John Piper, Wayne Grudem (who also attends SBC) as well as a number of respected bloggers such as Tim Challies. One of the things I noticed is that they all appear to be Calvinists. Hmmm...I have always struggled with the whole predestination idea. Could it be that I have missed something somewhere? 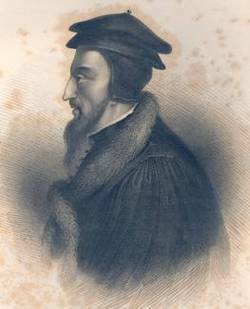 Why am I surround by Calvinists? The Scottsdale Bible Church's Statement of Faith even had many of the proponents of Reformed thinking in it. I just listened to a recent sermon by John MacArthur on the subject of Total Depravity/Doctrine of Absolute Inability. My head still hurts from that one. I intend to come back at it again and see if it takes root. Well...the next year in the life of David & Carol Porter is going to be interesting. I am confident that something exciting is nearby and we can't wait! We have only lived in the desert for a little over a year. 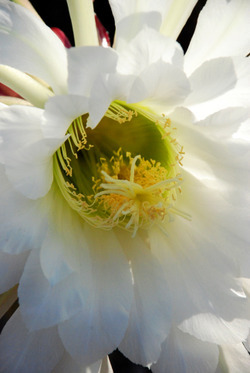 I still can't believe the beauty that comes from some of these cactus. This flower bloomed over night and was greeting us in the morning. Isn't it amazing the beauty that God has created from such a thorny plant? This should serve us all as a reminder what God can make of us. Who knew that such beauty loomed in these plants! I stand amazed! Ben Stein and "Expelled - No Intelligence Allowed"
We just returned home from the 10:20 A.M. showing of this documentary. I would guess that there were perhaps 50 people in the room at this early showing. -The movie begins and ends with the idea that freedom of speech and ideas is a foreign concept to the scientific community. If you hold to the belief that the world was created by Intelligent Design or worse yet, God the Creator, then you have no place in American scientific academia. If you have any exposure to our education environment, you surely must know that this is the case. The movie is suggesting that we speak up and bring freedom back to our educational system. -As a Christian, I believe that the science of Darwinism and the subsequent belief system that must accompany it is inconsistent with many of its proponents. I believe that many have bought into the bill of goods of the scientific "elite" and have not clearly thought this whole subject through. Darwinism and a moral compass are not compatible with each other. -I would encourage everyone to view this documentary. 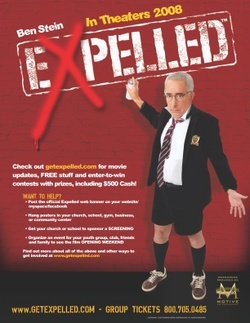 All Ben Stein and the movie "Expelled - No Intelligence Allowed" are asking for is an open forum for debate. What American could argue with that? Let the free debate begin. Lets be civil with one another. Lets not harm those who have different viewpoints. Our country has faced many, many difficult and explosive issues. Lets get on to the business of discussing this and bring the walls down! 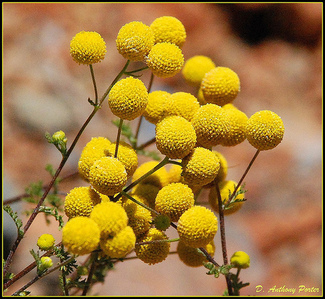 This week while hiking the Go John Trail, in the Cave Creek Recreational Park, I stumbled across this very interesting plant. 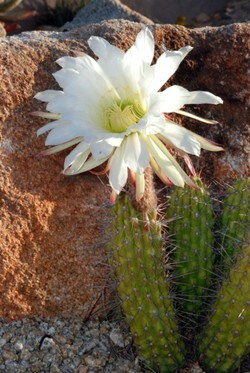 The Sonoran desert has been very beautiful this year with the abundant rains we received this past winter. Being new to the desert, I have deeply appreciated viewing God's creation in a land so completely different from the Midwest. When I encountered this flowering plant, I was once again reminded that God is a wonderful Creator. Click the player above to hear the Zacchaeus song. Do you remember this as a child? Following will be my notes from John MacArthur's on line video series entitled, "A Sinner meets a Seeking Saviour". I had no idea how packed full Luke's account of Zacchaeus was! I heard the story, sang the song, but today I got the message. I highly encourage you to take time to listen to Dr. John MacArthur's unpacking of this story. Just click the link above. Verse 10 is the principle message of the whole story. In fact, the whole story is a real life illustration of this message and, as John MacArthur states, "perhaps the most valuable verse in all of scripture". 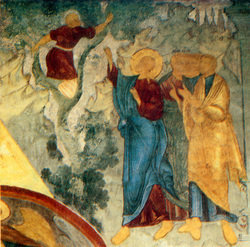 Luke 19:10, "For the Son of Man has come to seek and to save the lost".